And Neighborhood House was changing too. Last week’s interview with Irma Castro, who went to work at Neighborhood House in 1961, provided a glimpse into some of the changes. The community shifts from a supporting role to direct leadership. Irma Castro remembers that around 1963 or 64 Neighborhood House produced a gold-colored cookbook that was sold to raise funds for the various programs. The first recipe in the cookbook had directions for cooking an iguana. According to Irma the first step was to catch an iguana. Fund raising was led by Cuidar, a womens club, whose members’ husbands were rather well to do. Their fund-raising projects mirrored some of the fund raising activities led by the Marston family in the 1920s and 30s. Cuidar held a gala again similar to the garden parties held at the Marston House. The gala included a silent auction where Irma purchased a wood and iron table that her sister, Yolanda, still owns today. A citizen’s action group was formed at the Neighborhood House for the purpose of obtaining a crosswalk at the corner of National Avenue and Crosby Street. Mike Amador, owner of the grocery store across from Neighborhood House, led the effort. Mike is also a cousin of Irma and Yolanda. Mary Naranjo, who owned the New Mexico Café located across from Harbor House, was also a member of the committee. Irma helped write the proposal which was approved. This group was soon focusing on other issues around Neighborhood House. By 1964 Mr. Gayler had left his director position at Neighborhood House to become director of a settlement house in the Mission District of San Francisco. The new director was Ruby Hubert. The main offices had been moved to 43rd and Market. The settlement house focus at the National Avenue site was starting to fade and would be nonexistent by 1970. The feeling that Neighborhood House was the hub of the community had also disappeared. In 1964 Lyndon Johnson’s Great Society was born. The main goal of the Great Society was to eliminate poverty and social injustice. The War on Poverty brought a Headstart Class to Neighborhood House, replacing the existing preschool program. Even though Headstart was appreciated and supported, it was not seen as a big change or something unique for the community. During the summer of 1968 I was a college student teaching in the preschool class. The summer of 1967, Salvador “Queso” Torres taught an art class at the Neighborhood House. There were programs at Neighborhood House, but the missing link was the emphasis of having a health clinic at Neighborhood House. In 1969 Irma left San Diego to further her education and to teach Chicano Studies at California State at Fresno (CSF). Elieze Rico had recruited her to teach there. 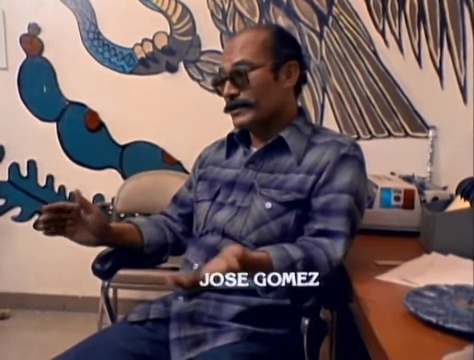 Elieze was founder of La Raza newspaper and would write articles for El Malcrado, the farmworkers newspaper. He was also instrumental in establishing Chicano Studies at California State College at Fresno. After Irma accepted the position in Fresno, Gus Segade offered her a position at San Diego State College. Cuidar offered Irma a scholarship, hoping she would become a social worker. Irma choose not to become a social worker but Cuidar still granted her the scholarship. In 1963 Interstate 5 had dissected the Logan Heights community. What had once been a cohesive community was now a divided one. There was a Logan Heights Community north of I -5 and a Logan Heights community south of I-5. Kids that had once walked to Neighborhood House now had to walk over the bridge that was above Interstate 5 or walk around several blocks to reach the Neighborhood House. The unity once felt among the residents was now lost. Residents were not only dislocated but had moved to other areas of the city. 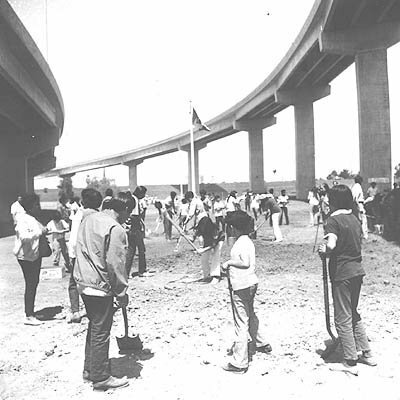 In 1969 the Coronado Bridge was inaugurated. Between freeway on ramps and the pylons from the Coronado Bridge, the barrio once again was dissected and made into a patchwork quilt. Junkyards had become a prevalent business and many of the business once found in the community were gone. The nation as a whole was experiencing a radical change between 1963 and 1969. 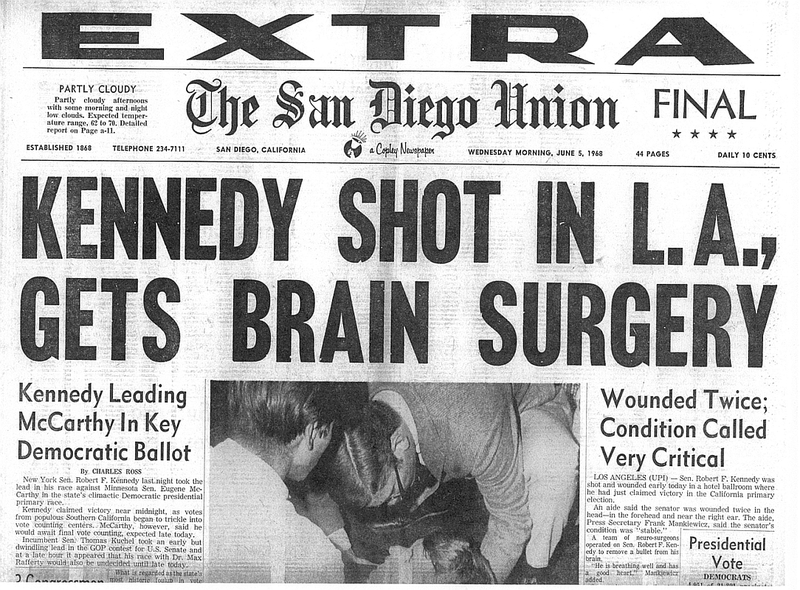 We had seen Dr. Martin L. King, President Kennedy, and Robert Kennedy assassinated all within a six- year period. Robert Kennedy was assassinated the night after he had been driven through Logan Heights, waving at the crowd that lined Ocean View Blvd. The Civil Rights movement had been in full swing and protests were seen regularly on TV. In Mexico there had been the Tlatelolo Massacre which had taken place in the Plaza de Tres Culturas. The Vietnam War had escalated as had the war protests. In August of 1970 the Chicano Moratorium took place in Los Angeles. Ruben Salazar, a Chicano reporter had been killed while covering the moratorium. We were questioning the injustices and the inequality found everywhere and anywhere. Between 1965 and 1969 there was a great deal of activism in the Latino Communities across the United States. However, 1969 and 1970 were the years that the San Diego Latino community experienced tremendous activism. April of 1969 the Plan de Santa Bárbara, a plan for higher education, was developed. In addition to focusing on higher education, there was the added plus of college students becoming more active in support of many of the concerns of the community. In April of 1970, Chicano Park was born; November of 1969 Camp Oliver and Católicos por La Raza came into being; and in October of 1970, the occupation of Neighborhood House occurred. The significance all of these events was that the community was feeling empowered. There was a belief that residents could make their voice heard and garner attention. Each of these events deserves a full article; however, in the interest of providing some clarity to the “mood “of the community, I have written a short description of several of these events and encourage everyone to take time to research each of these milestones. Chicano Park and the fight for the park gave the community new energy that set the groundwork for the takeover of Neighborhood House. The Plan de Santa Barbara had many effects on the future of Chicanos. It brought to the forefront the importance of a college education. It also gave Chicano college students a determination to take responsibility, not only for their education, but also for the Chicano Community. They may have lived in the dorms at San Diego State and other area colleges, but were aware of what was taking place in Logan Heights. A group of Logan Heights’ residents had petitioned the City Council for a park in the community. They were promised a park on a small piece of land between National Ave and Logan Avenue. At that time there was an adjoining piece of land they hoped to acquire to make the park a bigger. The residents were patiently waiting for the development of the park. 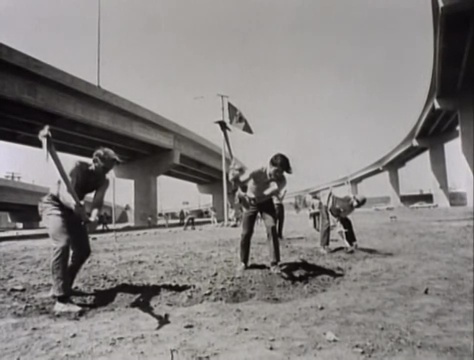 On the morning of April 22, 1970 under the Coronado Bridge, there appeared bulldozers and other heavy equipment. Their assignment was to build a Highway Patrol Station. To describe the community as furious is an understatement. They had patiently waited for over three years for the promised park and now they felt betrayed. Mario Solis was on his way to class at City College. The class at City College was being taught by Gil Robledo. Gil would become the first Chicano in modern times to run for the Mayor of our city. Seeing the bulldozers, Mario Solis went from door to door alerting people of the situation at the park. Today Mario is referred to as the Paul Revere of Chicano Park. Within hours the community had rallied “under the bridge” to protect their “future park.” A human chain was formed around the bulldozers. Laura Rodriguez was part of that human chain. In her own words Laura stated: “I went to the park and never went home again.” The park brought people from all parts of the city together. In pictures from the early days, you see young and old working together to build a park. Students from San Diego State, City and Mesa College, San Diego High School and Memorial stood side by side with community residents. I was a college student working as an instructional aide at Logan Elementary. I anxiously waited for the end of my work day to rush to what was to become Chicano Park. The late Father Juan Hurtado blessed the land that would forever be known as Chicano Park. 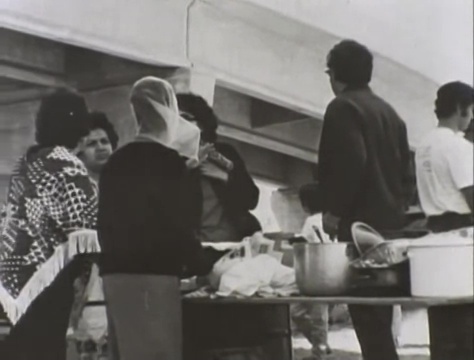 Some residents took the responsibility of providing food for all the workers at the park. Very little has been written about the role they played and the support they gave to Chicano Park. Long tables were set up with Mr. and Mrs. Alfredo Cortez, Graciela Romero, Charlene “Guera” Valencia, Irene Mena, and Laura Rodriguez working endless hours to provide food. With the exception of Irene and Laura, these residents are not usually mentioned when history of Chicanos in San Diego is written, and yet they made an important contribution. Irene Mena is often referred to as the “mother of the Brown Berets.” Irene grew up going to Neighborhood House, took dance lessons from Mrs. Villagrana ballet and folklorico from Albert Flores and remembered representing the Neighborhood House at a dance performance at the San Diego County Fair. As a teenager she jitterbugged to the music of Glen Miller and Les Brown at Neighborhood house. She has been involved in all the major Chicano events in Barrio Logan. The first meeting about the take-over of Chicano Park with a city official took place at Neighborhood House. Councilman Leon Williams came as the representative from the City. Councilman Williams had been elected with of support from the Logan Heights Latino community and was not only the council representative but was seen as a friend of the Logan Heights community. Latinos had coalesced to help Mr. Williams get elected and he certainly understood that there was mutual need to work together. At that meeting, Mike Amador a well-respected business man in the community, reminded them that he had asked for that land to be used for a park as far back as 1967. Having so many people voice their support for a park sent a very clear message that this was a united community effort. There would be other meetings while the city searched for a parcel of land to trade to the state for that small piece of land under the bridge. Assemblyman Peter Chacon authored a bill that would allow for a trade of land between the City and the State. The bill was coauthored by Wadie Deddeh and was unanimously approved. This process had taken almost a year. 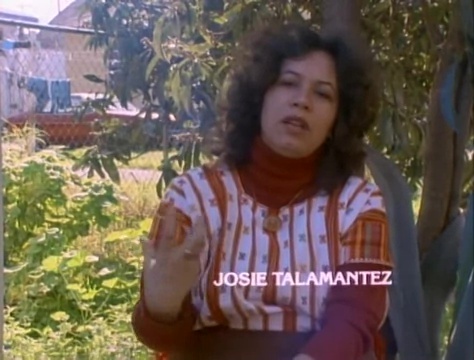 Today the murals of Chicano Park are on the National Registry, thanks to the endless hours of work of Josie Talamantez. Josie had the insight to recognize that the murals were a National treasure and worked tirelessly to make this dream come true. Tommie Camarillo was at the park from the first day. The park has flourished under the direction of the Chicano Park Steering Committee and the leadership of Tommie. Some see Tommie as a controversial figure. My take, and this is my personal, opinion, is that without Tommie’s blood, sweat and tears, Chicano Park would not have flourished as it has. The late Jose Gomez who at the time of the takeover was vice president of MEChA at San Diego City College, should also be recognized. 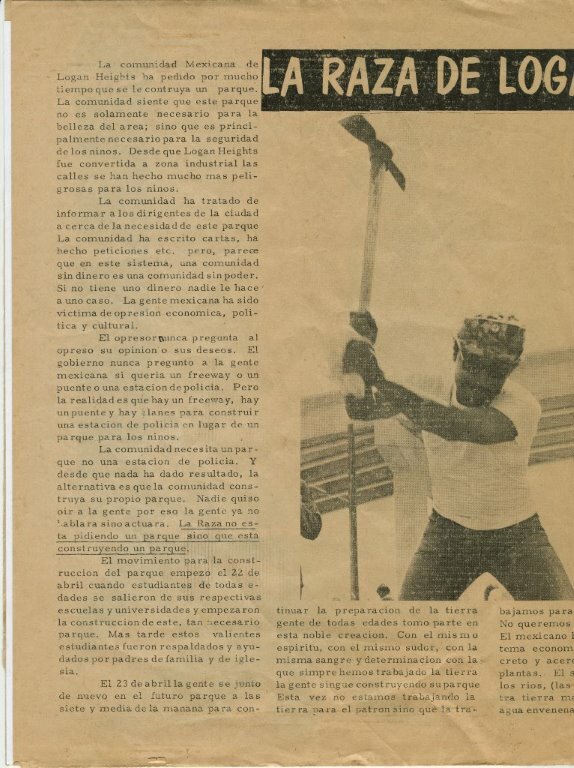 His reply when asked about how the State could take the land back was: “that the only way was through our blood.” This served notice that Chicanos were serious and willing to continue fighting for the park at any cost. I have always thought of Jose as a sweet and gentle soul. Some may disagree, but without question his determination, along with his work, made a difference in the final outcome of Chicano park. The victory of Chicano Park empowered the community. It gave everyone a feeling that by uniting together something could be accomplished. The Farm Workers Movement was at its strongest and every grocery store picket or victory gave Chicanos the “lead in their tank” to keep moving forward. The next victory would be Neighborhood House. Chicano Park and the Chicano Park Monumental Murals are both listed on the Nation Register. Thank you Josie i will add that when we update. Every bit of information helps.